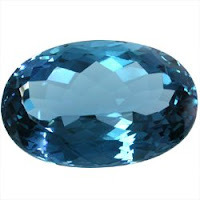 A stone of depth and personality, topaz is most commonly-found in the blue variety. Many pieces below are from Ross Simons; I'm posting today so you can catch a big sale, which ends August 2. Blue topaz is one of the most-common gemstones, quite sturdy and abundant. It's also the official state stone of Texas. The blue comes from irradiation, a stable, safe and accepted treatment. As with all coloured stones, a lively, transparent colour is paramount. You'll see a range of hues from palest blue (similar to aquamarine) through the popular pool-coloured "Swiss Blue", the deeper "London Blue" (shown, left), teal and the darkest, royal, which looks like sapphire, but more translucent. 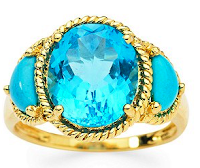 I like to see blue topaz treated like one of the finest gems, set in high-carat gold. Though I wear silver often, darker metal can drain topaz' character. 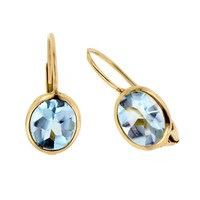 Birks Toni Cavelti Buff-top Blue Topaz Drop Earrings in 18kt Yellow Gold Price: $575. This is the palest I would buy, and see these earrings on a blonde. 7mm (about the size of a 1ct diamond) studs set in white gold, $135 from Blue Nile, a vibrant "Swiss Blue" for a good price. 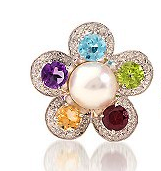 Pearls and multi-shaped topaz on a 1 1/2" white gold hoop for $175 (and 15% off) from Ross Simons. Charm, movement, pleasing proportion, and the price is pleasing too- I'd expect to pay about this for the gold hoop alone. The relatively low cost of blue topaz gives you some serious real estate for your buck, so if you love statement earrings, check these. Two tones of lush pear-cut topaz in a classic style: the bottom stones are 16x12mm (10 carats each), the top are 12x8 mm, and the setting, 14k yellow gold. Price is $395 and there's currently a sale, 30% off and free shipping in the USA from Ross Simons. Oh, baby! Turquoise and blue topaz ring, with a chunky 12x10mm Swiss Blue centre stone flanked by two turquoise cabuchons, set in 14k yellow gold. 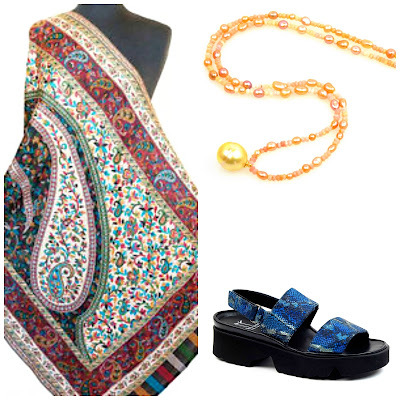 Wear this summmer with white jeans or LBD, and in winter as the antidote to gray and gloom. $335 but again, 30% off through August 2 at Ross Simons. Blue topaz brightens multi-gem pieces. 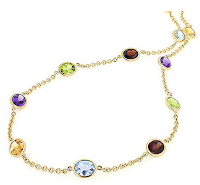 This 18kt yellow gold necklace features semi-precious buff-top gemstones of 9 x 7mm, and three each of peridots, amethysts, citrines, blue topaz and garnets. From Birks, $3,550. 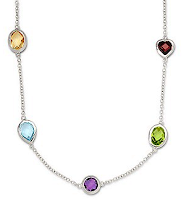 At Ross Simons, a lower-priced version of the multi-stone chain, 11 stones of the same mix set in silver, $95 for the 18" length. I'd happily wear either! Even more of a bargain is this pretty pair of Ross Simons multistone and pearl earrings, edged in diamond pavé, set in 14k white gold. I love blue topaz. I had an old-fashioned ring--oval stone with tiny diamonds on either side--and I had it redone in a silver setting with a gold circle around the stone. It is very modern looking and I wear it a lot. 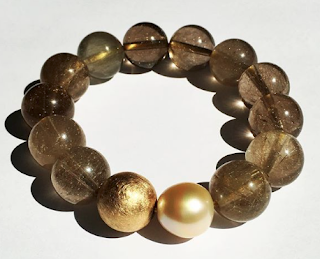 I love posts about colored stones and different ways to use them. 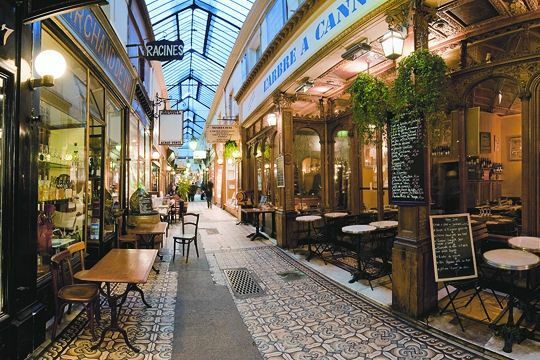 Ms Maven: I love jewelry remodeling stories, my regret is that comments do not allow pics. Thanks! The multicolor necklaces are cute. I would like to see the earrings ( the ones on the bottom ),on someone! I love the topaz because any hint of blue in our eyes are drawn out by the colour. I have hazel eyes which I can sway to look either bluer or greener according to the gem I choose. Pearl Drop: Yet another reason to love blue topaz, thanks!